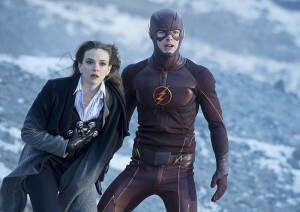 Flash ended up with a 1.4/5 in the key 18-49 demographic, tying FOX and beating NBC, and had 3.48 million viewers (beating NBC) for last night’s episode, “The Nuclear Man,” according to initial overnight ratings reports. The Flash also had its best ratings among Men 18-34 since the Arrow crossover. Last night’s THE FLASH raced to its best ratings among M18-34 (1.6/7) since the Arrow-Flash crossover episode on 12/2/14, and its highest M18-49 (1.8/6) since the series’ midseason finale on 12/9. THE FLASH ranked #2 in the hour in A18-34 (1.2/5) and #3 (tie) in A18-49 (1.4/5), and #4 among total viewers (3.48M). Week to week, THE FLASH was steady among A18-34, +8% in A18-49, +14% in M18-34, and +13% in M18-49. The final number should and often does go up even more. Time for a Firestorm spin-off, CW? If you’ve seen the episode and want to talk about it with other fans, come by our forum! See some photos from next week’s show here!